It's Casino Night at Meow Diaries and I am getting ready for a major unwinding session. I've just completed a huge translation job, which saw me working on it overnight and sleeping only the next afternoon. Sometimes it just cannot be helped and when my client demands for speed, I have to deliver. Anyway now that my job is over, I can finally release all my work stress and fatigue by devoting an entire night to fun and games, which is also the best way of de-stressing for me! I have my casino snacks and chocolates ready and the Gambling Cat is due any moment now. 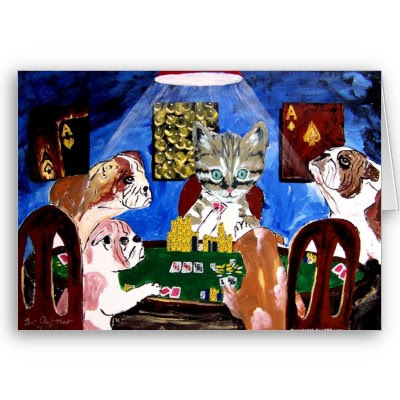 I wonder if my pals Pebbles and Piper play a little card as well for I'd love to invite them to my next casino night! We plan to have some poker fun with the rest of our buddies and proceed to online casino activities later. Thanks to Best Online Casinos for leading me to a great new ratings guide to the best casinos online, poker rooms and gaming sites on the web. I've already prepared all the cool casino games we're going to enjoy tonight and of course there will be plenty of Blackjack and Cho Tai Tee! I hope your night is going great as well, thanks for coming by! Sounds like you deserve all that fun. The games look wonderful. Hope you win something. weeeeeeeeeeh! let's play casino Pheebs, Benji and Chubbs! Thanks for chopping LJ, meow! Thanks for chopping too Mon! :-D :-D :-D :-D Thanks for coming by GG!